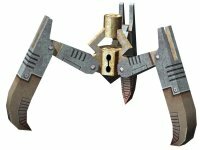 The Chaos Grappling Hook has a very basic design which allows even first time users to easily hook themselves around the map. One press of the ‘Grapple Hook On/Off’ button fires the grapple, as soon as it hits a wall it will dig in and instantly start to pull you towards that point. Once you get there, hit the same hook button again to be released. It’s just that easy! However, there are plenty of different ways you can have fun with it after a little practice. For example; after the grapple hooks something, and starts to pull you in, if you then press the hook button a second time, before you reach the end of your cable, you will stop being pulled in, and you can now swing from the cable. When you’re done swinging, just press it a third time to be released. In addition, while you are hanging from your grappling hook, the weight of your body will cause the cable to slowly be released, and you will be lowered. Hit your 2nd key, the ‘Grapple Hook Up’ key, to wind the cable back in, and you will be pulled back up. Additional Info: GravBelts use energy, and must be recharged for continued use. No longer do players have to ‘sit it out’ after getting fragged when playing Invasion! When you are fragged, you will be in spec mode just like normal. Then, simply keep changing your view from one player to the next (using your Fire key, as always), and IF there is a live proxy somewhere in the map, you will eventually get to him, and when you do, you are automatically ‘in’ the proxy. You will know when you are in control of the proxy when you see the HUD pictured here. You have limited controls available when you are a proxy. 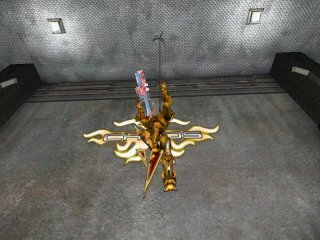 You can jump with your jump key, you can turn (but not strafe), and you can explode by hitting your fire key. So the idea is to continue helping to hunt down and kill monsters. Your HUD will display monsters as green icons, so hop around and chase them down, then blow yourself up when you get close enough! 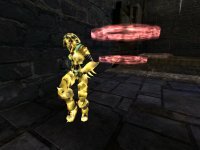 We have provided an option in the Chaos configs to have some adrenaline pills and health vials replaced with armor shards, randomly throughout the map. Not all health vials or adrenaline pills will be removed! So for example, if a map has a row of 5 health vials, maybe only 1 or 2 will now be armor shards. Note:To see the armor shards in non-Chaos maps, you must have selected this option in your ChaosUT2 configs! 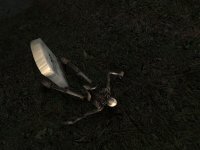 Note: The Jump Boot models do not fit correctly on all the different player models available in UT2003. So while you will see the model for the boots as a pickup item in the map, we have elected not to place them on the feet of the players. There are just too many player models whose feet don’t fit the boots. So instead we have used a visual effect to let you know who is using the Jump Boots. Note: You have to set one key in the ChaosUT2 key bindings for triggering a kick! Sure, you may have seen it before, but now we’ve brought it into ChaosUT2. Pick your own logo (if you submitted one of course) or use one of the stock choices, and paint it on the walls and stuff while playing. Simply bind a key for Spray Painting in the Chaos key bindings, and then select your choice of logo in the Chaos configs. Then all you have to do is walk up to a wall or something while playing, and hit your Spray Paint button. Note: To see the logos in-game, you must have ‘Projectors’ turned on in your Video Detail settings! 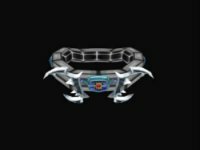 For those who want to know when other players are typing, we’ve included a talk icon. There is a client side option in the Chaos configs, and if you turn it on, you will see an icon appear over the heads of other players when they are typing. What you do with this information is up to you. Note: To see the Lens Flare, you must have this feature turned on in the Client Settings of the Chaos configs! And it only shows on maps which use the Sunlight Actor. No longer do you have to disconnect from a server, and then reconnect, just to go into spectator mode! 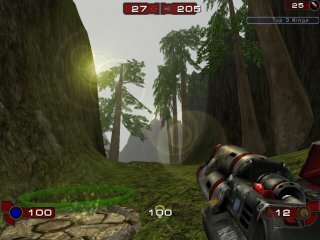 While playing ChaosUT2, all you have to do is hit your Esc button, and then choose “Become Spectator”, and you will be sent to spectator mode. However you will lose all points and adrenaline you’ve accumulated thus far. When you are ready to play again, simply hit the Esc button, and then choose “Become Player”. You will reenter the game with 0 points. Note: If stats are your thing, then be advised, your time as spectator may in fact count as time in-game! 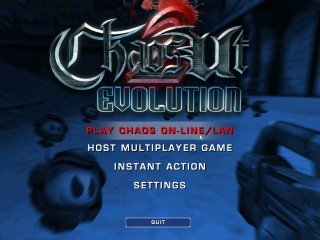 For those who are regular palyers of Chaos, and/or those who would like to have a Chaos background for your UT2003 start menu, we have included the custom ChaosUT2 shortcut. In your Windows ‘Start’ menu, you will find a shortcut for ChaosUT2 Evolution. Just click this when you are ready to play (of course you can copy it to your desktop if you wish), and you will have a Chaos background for your main menu. You also will find that you have a new server browser, designed specifically for Chaos. The first tab to the left is the “News” tab, which will now connect you directly to news updates from the Chaos Team. Next is the Chat tab, where you will find that the IRC chatroom for Chaotic Dreams is automatically filled in and selected. 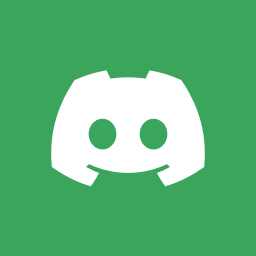 You simply click Connect, and then Join Channel, and instantly you are in live chat with Chaos team members and other fans of the mod. After that is the CUT Favorites tab, which is where you can add all your favorite Chaos servers. Works just like the normal Favorites tab, but is for Chaos servers only. 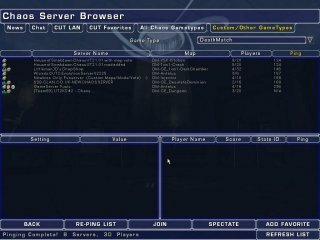 The next tab is this one is labeled “All Chaos Game Types”, and it will find all servers that are running any Chaos game type. The last tab to the right, “Custom/Other Game Types”, is for finding all the servers running Chaos as a mutator, rather than a Chaos game type. Click on this tab, and then use the drop down menu below to select which game type to filter. The browser will then display all the servers running that game type with the Chaos mutator. No more digging around in some INI file! 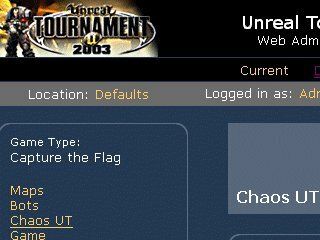 ChaosUT2 settings are now available to server admins through UT2003’s Remote Web Admin feature.